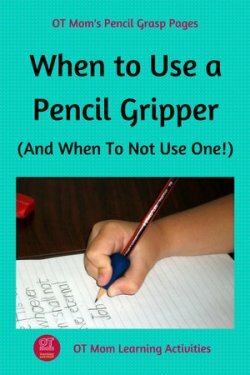 While I believe that pencil grips for kids cannot really improve handwriting on their own, there is a place for using a pencil grip or gripper as part of an overall program to improve a child’s handwriting skills. The aim of a “proper” pencil grasp is to be able to hold and use the pencil in such a way that is not tiring, and enables the child to carry out age-appropriate writing tasks with ease. Once a child’s fine motor skills have improved through the use of fun activities, I will sometimes make use of a pencil grip to train the fingers to hold the pencil more comfortably. The aim is to get the child to hold the pencil comfortably so the fingers can easily form the letters for smooth handwriting. These cute fish pencil grippers are marketed as “skill trainers” as they assist the child in holding the pencil at a more efficient angle, as well as positioning the fingers on the pencil. I like the fact that the child’s fingers are so easily placed, and the design of the grip makes it harder for the fingers to “slip out” of position. The design naturally opens up the space between the thumb and index finger and although it tends to favor the index finger being flexed (whereas I think you get more finger movement when the last index finger joint is neutral or slightly extended), I think these are a great choice of pencil grips for kids.